In partnership with LGBTQ organization All Out, LUSH is calling attention to the anti-LGBTQ laws in Russia, currently hosting the 2014 Winter Olympics in Sochi. 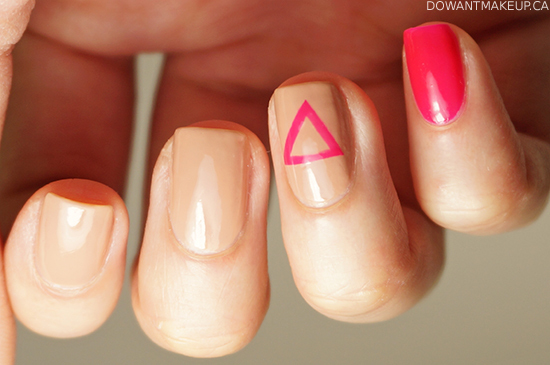 The #signoflove campaign is inviting people to post selfies wearing a pink triangle symbol on their bodies or faces. (The pink triangle was used in Nazi concentration camps to identify homosexual men; this symbol has since been reclaimed by the gay rights movement.) LUSH will be compiling the selfies into petition photo books to send to the Russian government on February 14, Valentine's Day in a show of solidarity with the LGBTQ community. Russia's ban on "propaganda of non-traditional sexual relations to minors" came into effect last year; it's been described as allowing for "vague definitions of propaganda". In my view, the ban is vague enough that just the discussion of non-traditional (read: non-heterosexual) relationships in a positive light could be "propaganda", punishable with fines, deportation, or imprisonment. Although it's not quite a "selfie", I posted my pink triangle nails on Instagram over the weekend. I thought about how to interpret the design on to nails for a while before I decided that a simple look fit a simple message: love is a basic human right. The fact that not everybody is free to be themselves or love who the love is a sad and terrible truth. Anti-LGBTQ attitudes exist all over the world, even if they may not be passed into law as in the case in Russia. To participate in showing support and raising awareness to end discrimination against the LGBT community, post of a photo of yourself wearing a pink triangle with the hashtag #signoflove. For more information, see the LUSH campaign page. You can also donate towards the campaign here.